Mike Geier, known as the clown dressed act Puddles Pity Party, has announced an extensive run of tour dates in 2019 bringing his cover songs and giant 6-foot 8-inch frame to the stage. Puddles Pity Party will first play nine shows at Las Vegas' Cleopatra's Barge at Caesars Palace before visiting select cities across the US including Charleston, North Carolina and Memphis, Tennessee. Puddles Pity Party will take his depressed persona to Dallas, Texas on March 21 to play the Majestic Theatre, presented by AEG. Tickets go on pre-sale on Dec. 13 with general ticketing opening on Dec. 14 at 10 a.m. AXS is also offering a VIP pass that grants access to an early admission pre-show as well as a photo op. For ticket pricing and availability, click here for event details. Puddles Pity Party will end his winter and spring tour with a pair of shows in Seattle, Washington's The Showbox on May 31 (Tickets) and June 1 (Tickets). 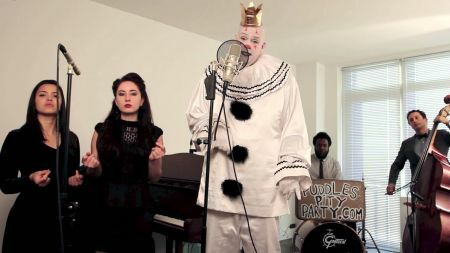 Though Puddles Pity Party has been performing for many years, he gained additional recognition in 2013 by covering Lorde's hit song "Royals" and partook in season 12 of "America's Got Talent" also singing "Royals" in the quarterfinals. In December 2018, P3 as he's dubbed released the holiday album Holiday Jubilee both digitally and on limited CD. Listen to Puddles Pity Party performing "Royals" above.